Braces, a form of suspenders, were fashionable in men’s wear beginning in the late eighteenth century through the early 20th century. They were first used when gentlemen’s trousers were high-waisted and unsuitable for a belt. Early 19th century braces were typically made of morocco leather but by 1840 it became popular to wear embroidered braces made in two separate bands, with tabs and buttonholes. The gentleman would attach these braces to buttons on the trousers. 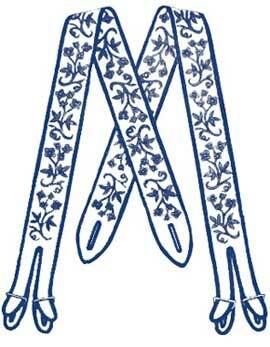 Photo: Mid-19th century gentlemen's embroidered "wedding" braces. Embroidered flowers are worked in shades of pink, red, blue, and green silks. is attached by two buttons in front and behind. 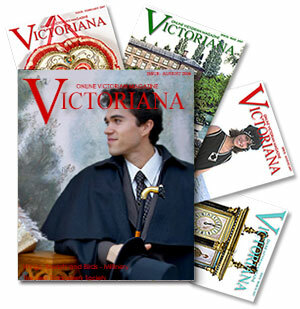 Many ladies’ fashion publications of the nineteenth century devoted pages to making fashion accessories for the refined Victorian gentleman – slippers, smoking caps and braces. Braces were the perfect gift for a young lady to embroider for her fiancé, or for a wife to create for her husband. The image on the right shows an 1853 design for braces made in two separate bands. Most braces were constructed of silk, velvet or canvas. During the 1850s and 1860s, Berlin woolwork on canvas was the most popular style of men’s braces. These braces featured brightly colored wools embroidered in either geometric or floral designs. Often these braces were worn by the groom at his wedding and were preserved as a family heirloom. A close-up of the mid-19th century braces shows the embroidered flowers worked in shades of pink, red, blue, and green silks.